A STEAM story: The Backyard Build by Litton – Joyce's mystery and fiction book reviews with some non-fiction too! This is the second book that I have read in this Science, Technology, Engineering, Art and Math (STEAM) series. In this one, two children build a playground in their backyard. They construct a swing, seesaw and slide. Elementary engineering information is introduced along the way and there are additional resources at the back of the book. This entry is clever. 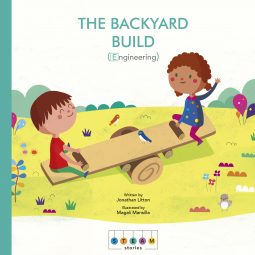 It may encourage children to build and to see that engineering plays a role in every day life. All in all, this is a good entry in a good series. Thanks to NetGalley and Quarto. The opinions are mine.